In this interview, Dr. Symes from DogtorJ.com discusses the latest research on gluten sensitivity, which reveals how everyone might well be gluten sensitive. It seems that only 1/3 of the population is having symptoms at any given moment, but this doesn’t mean that gluten is not damaging the health of the other 2/3! 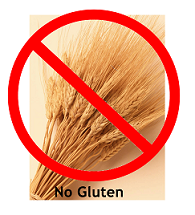 Perhaps the word “celiac” will be shelved and we’ll be talking about “gluten sensitivity” in the future. Food sensitivities can manifest not only in a myriad of diseases. Not only that, but chronic illness often involves a state of inappropriate vigilance of our immune/defense system in which food allergy gets involved even if it is not the cause of the problem, leading then to chronic inflammation – which translates into disease.